The Mortgage Bankers Association indicated that mortgage applications fell 13.7% last week. The drop left the weekly total down from the end of last month as earlier gains in applications slackened. Nevertheless, the monthly average level of applications rose 11.5% from September due to strong weekly gains during the month and a strong start to begin October. Applications to purchase a home fell hard during the last two weeks and the declines suggest a topping of a previously firm uptrend. The latest level was roughly equal to the early-August figure. During the last ten years there has been a 51% correlation between the y/y change in purchase applications and the change in new plus existing single family home sales. The correlation has lessened recently. 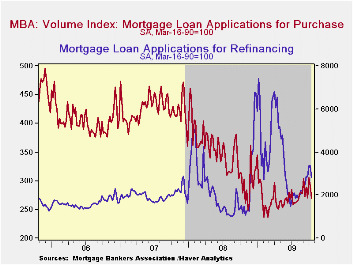 Applications to refinance mortgages fell hard last week but for the month so far remained up 17.5% from September and double the June low. Earlier declines in interest rates from the 2006 high had prompted refinancing at blistering 20% rate during most of 2007 and 2008. The effective interest rate on a conventional 15-year mortgage rose slightly last week to 4.75%. Though still down from the June average of 5.21% and near their lowest in decades, rates have risen slightly from the early-October low of 4.58%. For 30-year mortgages, the rate also rose slightly last week to 5.29% after reaching a high of 5.79% in early-June. Interest rates on 15-year and 30-year mortgages are closely correlated (>90%) with the rate on 10-year Treasury securities. Rates on adjustable one-year mortgages rose to 6.94% last week which was the highest level since November of last year. 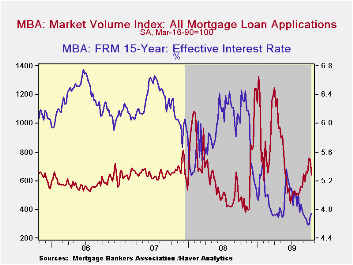 During the last twelve months, the number of fixed-rate mortgage applications has risen 51.0% while the number of adjustable-rate mortgage applications has nearly tripled. Gauging Aggregate Credit Market Conditions from the Federal Reserve Bank of San Francisco can be found here.